Madurai Shanmukhavadivu (M.S) Subbalakshmi, the nightingale of Carnatic music was born in Madurai, Tamil Nadu on September 16, 1916 to noted Veena player Shanmukhavadivu and lawyer Subramania Iyer. Young Kunchamma as she was called and her siblings was brought up in a musical environment in her home close to the Madurai Meenakshi Temple. Her grand mother Akkammal was a violinist. Her mother used to play and rehearse constantly and Kunchamma used to listen and hum ragas along with the Veena and the Nadaswaram recitals frequently heard from the temple. Her first Guru was Madurai Srinivasa Iyengar but her lessons could not last long as her guru passed away soon after she finished her foundations. But she kept practicing on her own for long hours. She did her formal schooling only till class 5th and music became the world for her. Subbalakshmi's perfect pitch whether high or low and fantastic range of voice is the result of her dedication, toil and hours of continuous practice. As a child, when she practiced she would stop playing the tambura in between to check whether she is maintaining the pitch with and without it. She also learned Hindustani music from Pandit Narayan Rao Vyas for a short while. In the 1930's she learned 'khayals' and 'thumris' from Dwijenderlal Roy in Calcutta and later from Siddheshwari Devi of Benares and bhajans and Rabindra Sangeet from Dilipkumar Roy, she incorporates bhajans in almost all her concerts. Little Kunchamma accompanied her mother in local concerts and later gave solo performances. She was the child prodigy of Madurai at one time. Her first recording was at the age of ten, when she recorded a couple of songs 'Marakat vadivu' and 'Oothukuzhiyinile' in an impossibly high pitch for HMV in Madras. In 1934, in her debut at the Madras Music Academy she was noticed and applauded by top rank musicians like Chembai Vaidyanatha Bhagavathar, Tiger Varadachariar, Karaikudi Sambavisa Iyer and the likes. 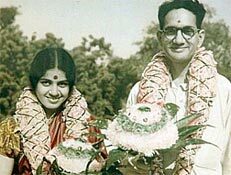 In 1940 she married Thiagaraja Sadasivam, a well known figure in the Madras Congress circle, at Thiruneermalai. They had met four years earlier and with his wide connections in the journalistic and political world, he became instrumental in the continued success of her already flourishing career. From 1938 for a period of six years she started acting in films for a short while. Her films were quite successful but later in 1944 after her big hit 'Meera' produced by her husband and released in Tamil and Hindi, she quit and concentrated solely on music.From a South Indian celebrity she went on to become a national figure. Internationally she has given concerts almost all over the world like at Edinburgh festival and at the United Nations(1970), Carnegie Hall as the inaugural concert of the festival of India in London in 1982. Subbalakshmi has been the recipient of the highest awards and honours the nation could bestow upon an artist and significant international recognition. She has earned doctorates from famed universities and her divine voice has earned acclaim from big and famous personalities like Mahatma Gandhi, Pandit Jawarharlal Nehru, Maharana of Udaipur etc as well as top rank musicians both in the Carnatic and Hindustani sphere in the country. In 1998, she was the first musician to receive the highest civilian award 'Bharat Ratna' from the President of India. Padma Bhushan(1954), Padma Vibhushan(1975), Ramon Magsaysay award (1974) are some of the major awards she has received. The world of fame and adoration of thousands of fans, has left Subbalakhsmi untouched. She remains the simple, neat, devout, down to earth person she always was and having a genuine interest in others. She passed away at the age of 88.